EMCS International Limited’s (hereinafter be referred to as “EMCS”) are committed to maintaining a high level of quality and strong customer service within an environment that places safety as a first priority, is focused on its customers, and fosters continual improvement. EMCS have adopted a Quality Management System (QMS) in accordance with ISO, ISM, MLC2006 and Maritime Law. EMCS have a Quality Management Manual in place which is drafted and updated according to the EMCS QMS and is available on request. 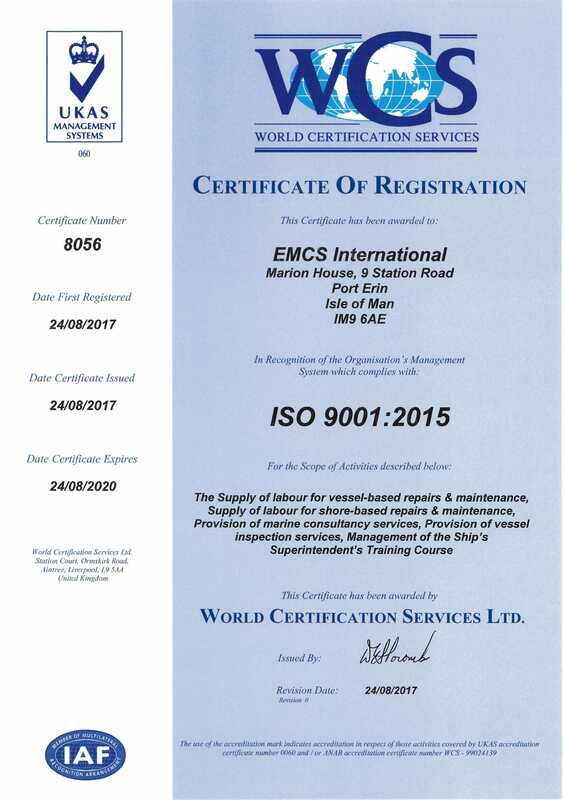 EMCS are very pleased to confirm that as of August 2017 we now hold ISO9001:2015 Certification issued by World Certification Services according to the above mentioned scope of business.